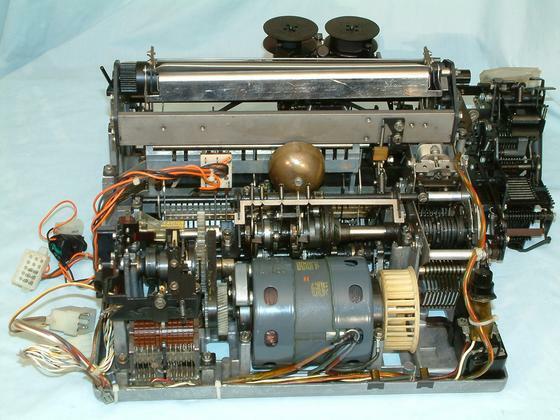 This is the rear of the ASR 33 Teletype teletypewriter set main assembly. In the middle is the 3600 RPM 1/12 HP motor which powered it. Above the motor is the main shaft and above it is the end of line bell. On the right is the selector cams ( 59K) used to decode the incoming serial data. On the upper far right is the paper tape punch. In the lower left is the answer back drum. By breaking off the little tabs where you program a 20 character sequence that the teletype can send when the "HERE IS" key is pressed or if enabled when the WRU (ENQ, ascii 5) character is received.